Cyanide Studios has released a trio of new screens from the upcoming fantasy infiltration-assassination game Styx: Shards of Darkness that showcase some lovely, large, and eminently-climbable levels. Styx: Shards of Darkness follows the adventures of a cynical Goblin assassin who, after the events of the entirely decent Styx: Master of Shadows, is forced by circumstance to sneak into the nigh-impregnable Dark Elf city of Körangar. 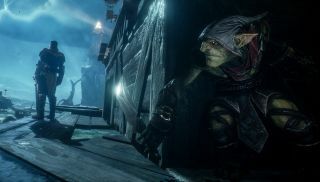 It promises a “nimbler, more refined” version of Styx than that of the previous game, as well as a more fully-realized world that will include many more locations than just Körangar. Styx: Shards of Darkness is set to come out later this year. Find out more at styx-thegame.com.